Pulse Controller is a hardware / software solution that liberates computer-based musicians and performers from conventional input devices by allowing surfaces - desks, laptops, objects and more - to become playable MIDI controllers. 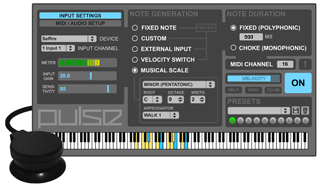 An included piezo sensor coupled with a powerful software mapping interface converts acoustic impulses into MIDI Note messages for playing your software instruments in an intuitive, responsive and connected manner. A useful drum arpeggiator for Ableton Live that enables you to quickly perform complex rhythmic parts. Use the xy grid with a mouse, or assign an xy controller for hands on access. A pair of devices to allow for quick MIDI composition inside Ableton Live. Generate chords in a variety of keys at the click of a mouse (or press of a key on a MIDI keyboard) and create complex arpeggio patterns via a powerful step sequencer.